Organist, keyboardist, pianist, master of all keys John Novello started his solo career with the album Too Cool (1990), followed by Always & Forever (2004), Threshold (2004), Organik (2005) B3 Soul (2008) and Ivory Soul (2016). His newest project is Good To Go (2019). The album was produced and engineered by John Novello and Andy Goldmark. Most of the tracks are written by John Novello, some by Andy Goldmark in parts with other writers. The album also offers two covers. John Novello plays on this album acoustic piano, electric piano, B3 Organ, Korg synthesizers and on selected tracks bass. He is joined by Eric Marienthal, Jeff Nathanson, Jazmin Ghent, Jeff Ryan (sax), Adam Hawley, Chris Standring (guitar), Eric Valentine, Rayford Griffin (drums), Andy Goldmark (drum programming), and Alberto (percussion). Friends of the music of The Rippingtons will love the uplifting and dynamic sound of Good To Go which is stylistically very similar to the music of this group. The renewed collaboration with saxophonist Eric Marienthal has a beneficial effect on the quality of the title song. Skin In The Game relies on the reggae style as it has become popular by Bob Marley. While the hooky main melody is sketched with the e-piano, John sets virtuoso moments on the piano for the special finish. Thanks (For Being You) has an impressive almost infectious vibe generated by piano playing and parallel chanting. The smooth ballad Love Affair presents guitarist Chris Standring in the role of a romancer, surprising for most fans. The highly accessible Busted features rising star Jazmin Ghent in an organic presentation of sax and piano. Goodbye Pork Pie Hat is a jazz standard composed by Charles Mingus, originally recorded by his sextet in 1959 on his album Mingus Ah Um. John Novello transforms the piece to a contemporary habitude. Happy Place throws in a great punch of cheerfulness and invites you to sing along. Give You My World spreads good buzz featuring Jeff Ryan on sax and the tune flows effortless along. Alma Feliz means Happy Soul, the Latin tinged counterpart to Happy Place. My Favorite Things is a show tune from the 1959 Rodgers and Hammerstein musical The Sound of Music. The song is very popular even in the smooth jazz genre covered by David Garfield, Jeff Logan, Nicole Henry or Nick Colionne. John Novello's piano interpretation is vigorous with a direct sense for the melody. 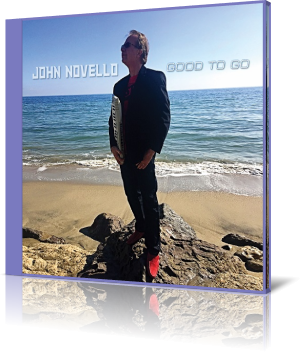 John Novello approaches on Good To Go his music with a pronounced feeling for the essentials and key elements of his songs. That way he grants us unhindered access to his personal musical world.